This paper from Hospital Pharmacy is giving a guarded approval for the use of Oxymetazoline topically for the redness of rosacea. Even though the FDA has not approved Oxymetazoline as a topical skin treatment, it is approved as a nasal decongestant. Doctors are able to prescribe drugs for off-label use, that is once a drug has been approved for one condition, there is some freedom for doctors to propose it for other conditions. Oxymetazoline 0.05% solution, as mentioned in this paper is available as TopCare Sinus Nasal Spray and also Afrin Nasal Spray. We know that Allergan are conducting trials to establish the best amount of active ingredient to include in their Oxymetazoline Cream. Given the question hanging over the rebound redness issues with Mirvaso, one should also be careful with products like Afrin as rebound issues may well arise. Hosp Pharm. 2013 Jul-Aug; 48(7): 558–559. Intranasal oxymetazoline 0.05% solution applied topically once daily to affected facial areas for up to 17 months. The topical use of oxymetazoline 0.05% solution in the management of rosacea has been primarily limited to data from case series involving fewer than 10 patients and demonstrating sustained improvements in both erythema and flushing. Alhough oxymetazoline is not recognized in national guidelines, an international consensus statement recognizes the possible therapeutic role of oxymetazoline in the management of rosacea, despite the limited evidence. For symptoms of periodic flushing, vasoactive drugs are also recommended, including topical oxymetazoline and oral nadolol, ondansetron, or clonidine, despite limited evidence. The FDA-approved topical therapies are suggested as first-line treatment for persistent erythema or rosacea characterized by papules and pustules. In 2 case reports of adults (aged 55 and 70 years) with a history of refractory erythema and flushing related to rosacea for several years, topical oxymetazoline 0.1% solution was applied once daily to affected facial areas. A decrease in facial erythema was noted within 1 hour after application, and a dramatic improvement was observed within 2 to 3 hours. The effects were sustained throughout the day. Continued use for several months was associated with marked improvement in erythema without episodes of flushing or flares. Both patients experienced sustained effects with prolonged use of 8 and 17 months. This is a limited safety profile. Refer to package labeling for complete prescribing information (eg, warnings/precautions, adverse reactions, drug interactions). Concerns with the use of intranasal alpha-agonist decongestants include the loss of efficacy with prolonged use (tachyphylaxis) and possible rebound vasodilation, although these effects have not occurred in the limited number of patients studied. Oxymetazoline: what about rebound redness ? not worried about the redness, what about burning,pain and stinging and flushing. The only thing that helps me is cool green tea compresses followed by jojoba oil. That is the only thing. Metro gel burns! I tried AFRIN and it didn’t help me. I wish it would have for the portability factor. 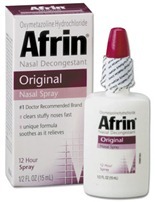 I started using afrin , applying it w a nutrigina face whips. It has really calmed my face down. In just 2 days! No, due to the rebound potential I did not use Afrin long term. I am trying this, I have used it 2 times and it seems to reduce my redness. I can feel my face trying to flush at times but when I look in the mirror it is not red! I have not noticed any rebound flushing. I really hope this continues to work, haven’t noticed any sensitivity either. 3rd day and it didn’t seem to work as well, I definitely had more redness than the previous 2 days using the Afrin, although not anymore than usual. Perhaps prn is eay to go with these products if relief appears to be so immediate? Do you use the spray or cream ? I can’t find cream here in Canada.